It dawned on me this weekend that last month our blog turned two years old! It wasn't until I reread our very first blog post that it dawned on me just how much we have done/seen/accomplished over the past two years. Our lives have changed immeasurably in so many ways. When I read that first blog post I can hear the apprehension in my voice -- as if even three months before our move abroad I was still really wondering if it would happen. I'm not trying to pat ourselves on the back when I say this, but making such a big life change takes a lot of planning, guts and faith. I'm proud of us for dreaming so big and working to make it happen. 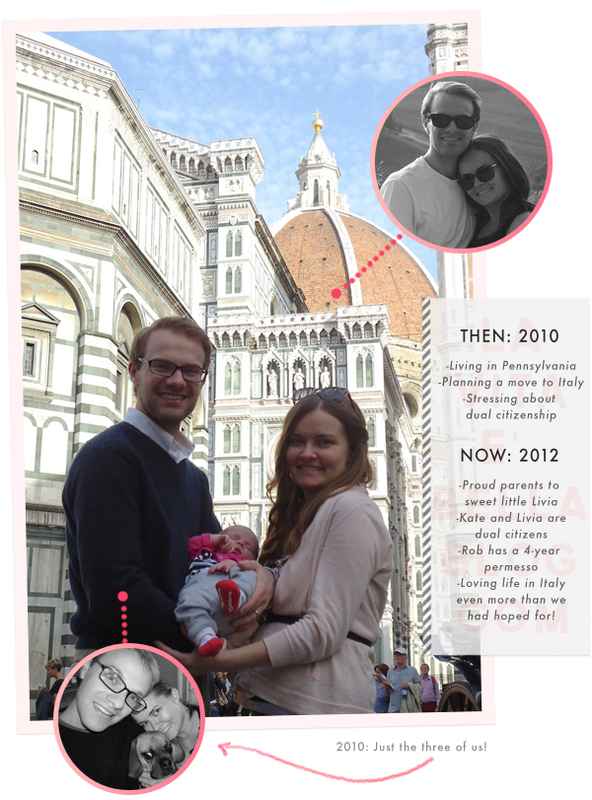 If you had told me in September 2010 that I would have my first child in Italy I'm not sure I would have believed you! We've been a little lazy with our blogging recently and I promise it will change soon! I keep getting emails from readers asking "So, are you a dual citizen yet?!" and realize that I owe you all a couple posts about the dual citizenship process. The answer is: yes, we are (Livia and I, that is). But the process was long and often confusing -- but oh-so-typically-Italian -- and I think my experience could help others. They will be long posts, so I'm collecting and organizing my thoughts for you. Keep an eye out for those posts soon!